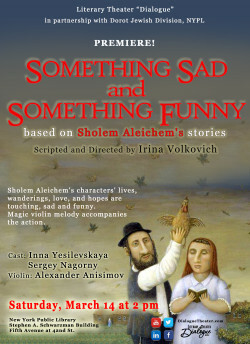 Something Sad and Something Funny is based on Sholem Aleichem’s stories. The exchange of letters between Menahem-Mendl, trying his luck in the bigger cities of Czarist Russia, and his wife, who remains behind in a small town in the hinterlands, relates his hilarious, but frustrating, experiences as he seeks his fortune-first as a currency and stock speculator (who cannot speculate), as a matchmaker (who cannot arrange marriages), as an author (who cannot write), and as an agent (who buys what he cannot sell). His letters to his wife are alternated with her caustic, frustrated replies. Like Mark Twain, Aleichem’s writing is characterized by combining humor with social criticism.